, an ingenious poet of the eighteenth century, was born Oct. 31, 1724. He was the son of the Rev. 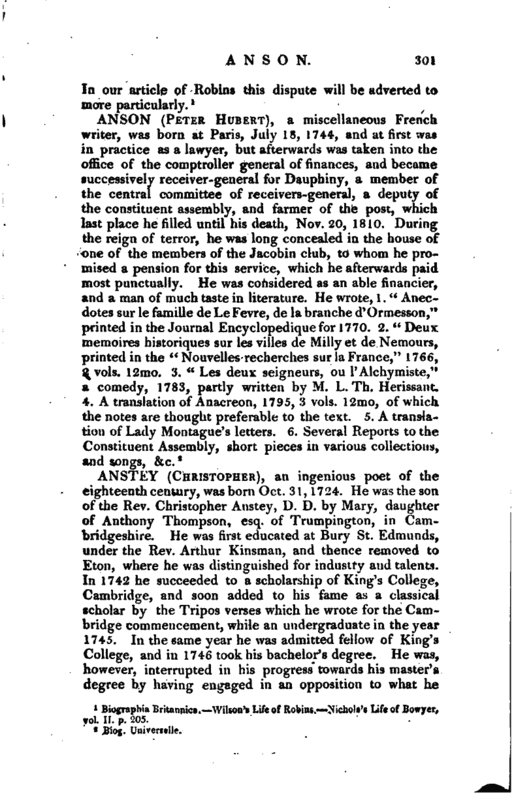 Christopher Anstey, D. D. by Mary, daughter of Anthony Thompson, esq. of Trumpington, in Cambridgeshire. He was first educated at Bury St. Edmunds, under the Rev. Arthur Kinsman, and thence removed to Eton, where he was distinguished for industry and talents. In 1742 he succeeded to a scholarship of King’s College, Cambridge, and soon added to his fame as a classical scholar by the Tripos verses which he wrote for the Cambridge commencement, while an undergraduate in the year 174.5. In the same year he was admitted fellow of King’s College, and in 1746 took his bachelor’s degree. He was, however, interrupted in his progress towards his master’s degree by having engaged in an opposition to what he | conceived to be an innovation in the constitution of his college. King’s college had immemorially exercised the right of qualifying its members for their degrees within the walls of their own society, as is the case in New college, Oxford, without that regular performance of acts and exercises generally in use in the university schools, and required of other colleges. It was, however, proposed as a salutary regulation, and a fit employment for the bachelor fellows of King’s, that they should occasionally compose Latin declamations, and pronounce them in the public schools, a regulation altogether new and unprecedented in the annals of King’s College. 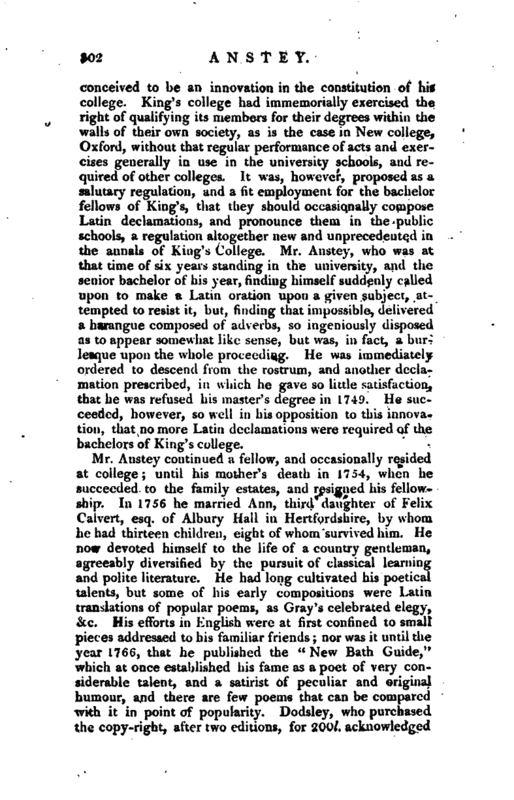 Mr. Anstey, who was at that time of six years standing in the university, and the senior bachelor of his year, finding himself suddenly called upon to make a Latin oration upon a given subject, attempted to resist it, but, finding that impossible, delivered a harangue composed of adverbs, so ingeniously disposed as to appear somewhat like sense, but was, in fact, a burlesque upon the whole proceeding. He was immediately ordered to descend from the rostrum, and another declamation prescribed, in which he gave so little satisfaction, that he was refused his master’s degree in 1749. He succeeded, however, so well in his opposition to this innovation, that no more Latin declamations were required of the bachelors of King’s college. 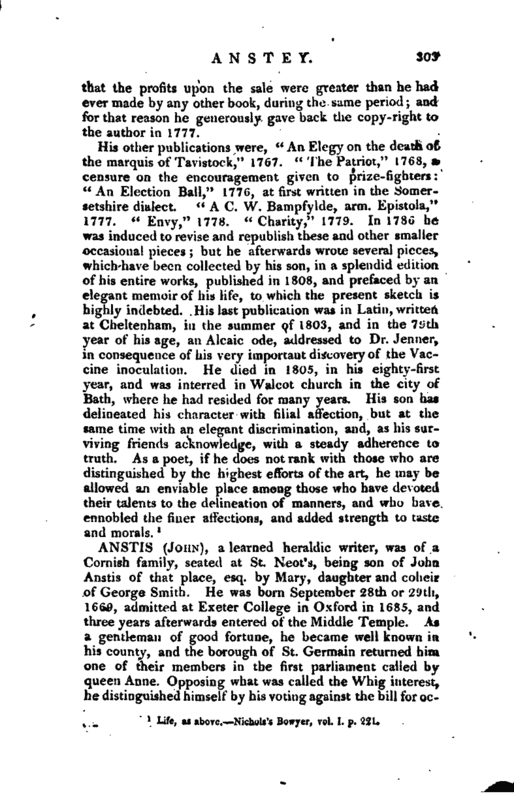 Mr. Anstey continued a fellow, and occasionally resided at college; until his mother’s death in 1754, when he succeeded to the family estates, and resigned his fellowship. In 1756 he married Ann, third daughter of Felix Calvert, esq. of Albury Hall in Hertfordshire, by whom he had thirteen children, eight of whom survived him. He now devoted himself to the life of a country gentleman, agreeably diversified by the pursuit of classical learning and polite literature. He had long cultivated his poetical talents, but some of his early compositions were Latin translations of popular poems, as Gray’s celebrated elegy, &c. His efforts in English were at first confined to small pieces addressed to his familiar friends; nor was it until the year 1766, that he published the “New Bath Guide,” which at once established his fame as a poet of very considerable talent, and a satirist of peculiar and original humour, and there are few poems that can be compared with it in point of popularity. Dodsley, who purchased the copy-right, after two editions, for 200/, acknowledged | that the profits upon the sale were greater than he had ever made by any other book, during the same period; and for that reason he generously gave back the copy-right to the author in 1777. Life, as above.Nithols’s Bowyer, vol. I. p. 221.